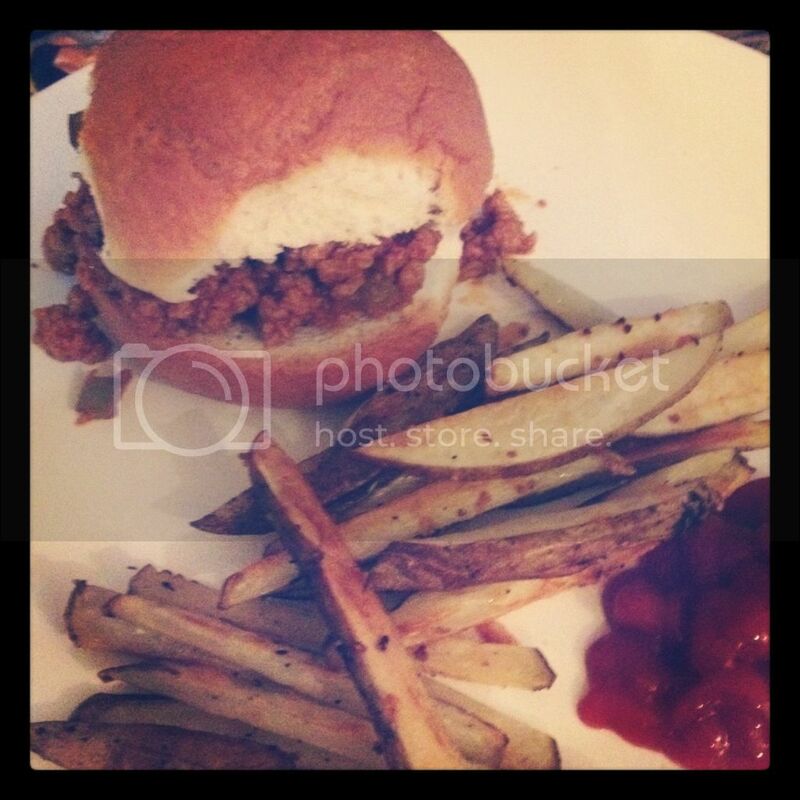 This week on The Pioneer Woman's show on the Food Network she made sloppy joes. I had been thinking lately that sloppy joes seemed like an easy dinner to make one night after a busy day at work, and had been thinking about picking up some Manwich, but after watching The Pioneer Woman make them from scratch I thought I can do that! And I had almost all of the ingredients on hand, just needed to pick up some ground turkey and a bell pepper. I also fixed some steak fries. I just cut up some potatoes (leaving the peel on) into fry like sticks, drizzled with a little olive oil, and then sprinkled some steak seasoning, salt and pepper and baked at 400 degrees until crispy. This took like 30 - 40 mins. I didn't really time it, just kept an eye on it until they looked like fries. Add ground beef/turkey to a dutch oven over medium high heat. Cook until brown. Drain most of the fat and discard. Add green pepper and garlic. Cook for a few minutes, or until vegetables begin to get soft. Add ketchup, brown sugar, chili pepper, dry mustard, and water. Stir to combine and simmer for 15 minutes, adding salt and pepper to taste. Also add Worcestershire and Tabasco if desired. Taste and adjust seasonings as needed. Spoon meat mixture over the rolls and enjoy!